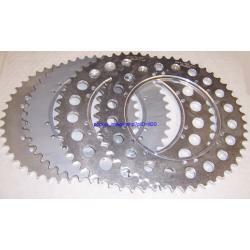 A Talon aluminium rear sprocket suitable for the Triumph Tiger Cub hub, 520 size, suitable for trials use. This is multi drilled, for many hubs including the BSA Bantam D7 and onwards, and also the Whitton hub. Suitable for a 520 chain size, and with 42, 44, 46, 48, 50, 52 or 54 teeth. The 42, 44, 46 and 48 tooth sprockets are plain, the larger sizes are drilled with lightening holes. You cannot use this on the Tiger Cub as 520 front sprockets are not available, but is very suitable for the BSA C15 and B40 etc. singles where a 520 front sprocket is available. Please choose the number of teeth in the dropdown.